Set on an attractive market stall, bunches of fresh garlic are ready to flavour many dishes of the people living in the Camargue region of France. Most markets are held in towns, but this attractive market stall holding bunches of fresh garlic is just one of many in the Parc Naturel Regional de Camarque located at the mouth of the Rhone river in France. Established in 1970 the regional park contains some of the most untamed countryside in Europe. 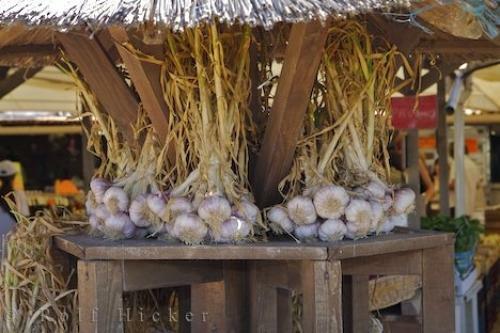 The park's museum and market reflects the produce, plants, animals and history of the Camargue region.Garlic at a market stall in the Parc Naturel Regional de Camargue, Plaine de la Camargue, Camargue, Les Bouches du Rhone, Provence, France, Europe. Photo of a garlic stall at the market in the Parc Naturel Regional de Camargue in France, Europe.